Michael Dillon Docks is a Class A contractor and we are fully licensed and insured. We offer no obligation quotes. We offer complete design and build services. We work with your architect or engineer or ours. We also offer limited support like poles and banding for do it yourself homeowners who wish to do some of the work themselves. We also work very closely with AEP to acquire permits in a timely manner. Just give us a call and let us help you get things moving so that you can use your dock sooner rather than latter. Let us handle every aspect of your job... design, permits, construction, and all finishes. 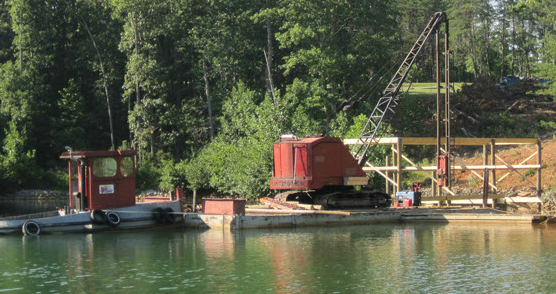 Let us enlarge your existing dock, add a floater or modify your dock to accommodate your new boat. Water and wood usually means on-going maintenance. Let us get everything cleaned up for the summer season... replace worn boards, pressure wash and stain, add a few electrical outlets or complete the annual service needed for your boat lift. If you are someone who wants to save a little money by doing some of the work yourself...no problem. Let Dillon Docks drive your poles and complete the banding and roof.